Usually I don't have fabric as a find, but the curtain and curtain rod were thrifted and finally they are upgraded. I really hate the elbows out, hyper alert/focused and downright not nice attitudes that some campers have (campers is a new descriptor that makes a lot of sense). Thanks for continuing to host, appreciate it. I'm with you, don't like those people at all, but I guess we gotta deal, right? This week I have been working on keeping the thrifted stuff that I use and getting the thrifted stuff I am not using ready to share with others. Thanks for hosting. Send some my way, Rob! Your Pampers towel is a unique find!! Love the cards, lucky find!! I'm in love with the table runner and the Valentine cards.So what do you do with all your cards that you keep? Do you display them or just keep them in a box? In a box. How fun, right? I'd like to decorate seasonally, but just don't really got 'IT' right now.. Your paper ephemera finds are always SO interesting! And I love the sheets as well! Thanks! Besides Pyrex ,they are my favourite thing to thrift for. They have always been on the top of my list. That table runner is amazing! I love it! Great finds! I love your vintage Pyrex finds!! Lisa @ happy Girl Thrift! I adore the runner that you found! And the pyrex is great. 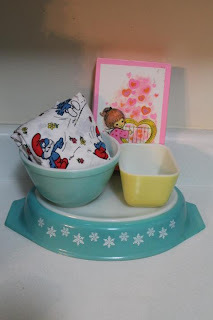 I learn so much about pyrex by reading your blog. Thanks. & I have been thinking the same thing - STOP BLOGGING!! Can't say that I've ever dealt with crazy people shopping. I've ran into a couple of jerk-wads over the years but I have never experienced people fighting over items or getting mean over the merchandise. I love all the pop culture scores! The flat sheets and turtles/batman bits are glorious. I'm jealous of anyone who is finding pyrex at the thrifts. I haven't found a piece in months! I didn't find any Pyrex this week! I'm so jealous of your turquoise score! I haven't been to the thrifts in ages. I also haven't spent a huge amount of time driving around to sales. Some of the dealers have really turned me off and taken a lot of the fun away. That Pampers towel is hilarious. I can't believe you found one! You always have such good luck with the Pyrex -- love the snowflake piece! Love the snowflake pyrex and that table runner is great. I hear ya with the dealers being everywhere! Love your Pyrex finds. My collections is growing too. Thanks for hosting, love joining in. Love the Christmas runner! If its marked W. Germany then it is definitely vintage. My understanding is that "West Germany", as a country, ceased to exist around the time the Berlin wall fell in 1990. It says, West Europe. I'll Google it. I don't care either way, it's really nice, but it's nice to know about everything you have, you know? 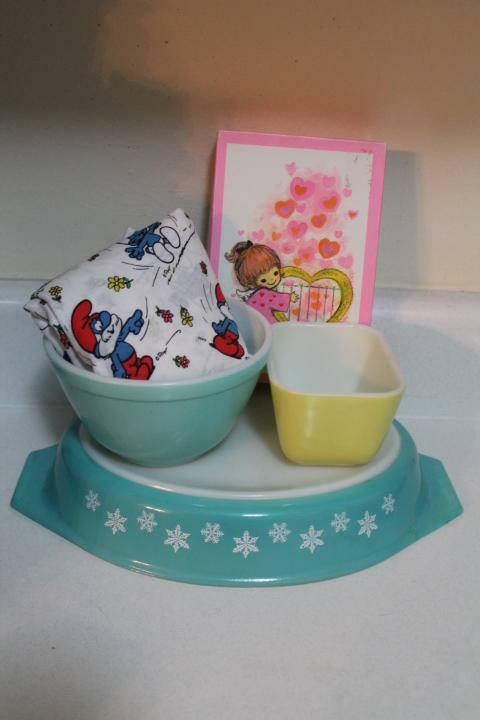 Your Pyrex finds are my favorite from your haul. Everything is really fun and that Christmas runner looks to be very good quality. Thanks for hosting! You always find the most amazing things!! 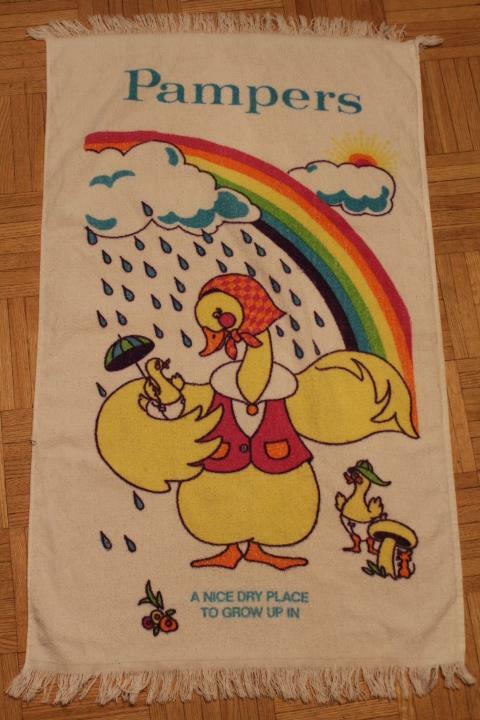 I am envious of you bed sheet finds! I really want a Transformer sheet so bad!! I found a She-ra twin comforter once and since than, nothing. I also have a thing for paper table cloths. I've got some snowflake pyrex too this week :) Love your vintage greetings cards. Join EverydayFamily TODAY and you will get stage by stage pregnancy and baby newsletters, promotions and weekly coupon alerts as well as access to free baby samples, coupons, baby magazines & more. All New Members are Entered to Win Free Diapers for a Entire Year!